Tacos and Tuesdays go hand-and-hand, right?! Which is why we had to have special tacos… Tacos that are only available on Tuesdays! Luckily for you, this deal happens once a week—so next time you are looking for a much needed pick-me-up on a slow Tuesday, join us! Oh, and of course we have to include tequila into our Taco Tuesday! Stop by today (well, as long as it’s a Tuesday for tacos) for tequila and tacos at Ross & Hall! At only $3.50 per taco—you can buy (and eat!) all four of our unique and flavorful options. This ain’t your regular Taco Tuesday—our options are literally so good that sometimes we wonder why they’re only offered on Tuesdays… But, we seriously love all of them and get excited every time Taco Tuesday rolls around! Tangy, delicious, and of course, a little fiery—this taco is bold and delicious. On top of your taco will be shrimp, jicama slaw, red bell peppers—and some Asian fire sauce. Luckily for you, we have $3 tequila drinks that (might?) help cool your mouth off. Or, don’t forget—you can add rice and black beans for only $3! Heat lovers, this taco is for you! Still bringing the heat and flavor, we have our delicious pulled pork taco! This taco has bold pepper jack cheese, cilantro, onions, and salsa verde. All the flavors work together to make you come back for every Tuesday after you try this taco! Crispy pork belly is good enough on its own, but even better as a taco—we promise. With this taco, you will be getting cilantro lime slaw and some spicy mayo! We had to give this bad boy a kick with the spicy mayo—tacos should be a lil’ bit spicy, right?! Last, and certainly not least, we have our tasty brisket taco. The most moist brisket you have ever had is paired with caramelized onions, queso fresco, and salsa roja. All of these flavors combine to make one hell of a taco. Tacos are great, and they go so well with tequila drinks! Thankfully, we have $3 tequila drinks to pair up with your favorite taco(s) to celebrate the best day of the week—Taco Tuesday! 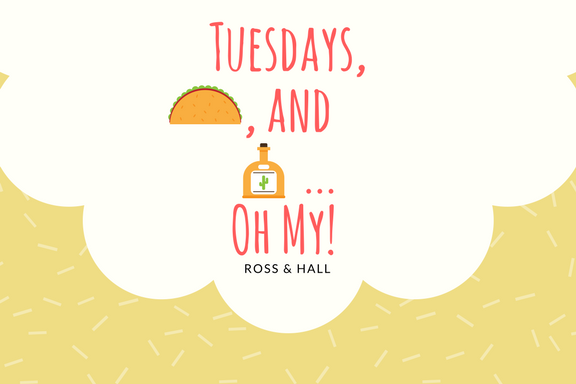 Remember: Tacos are $3.50 each, tequila drinks are $3 each, and you can add rice and black beans on the side for only $3, too—these delicious deals are only available on Tuesdays at Ross & Hall!